It's not Jem Stonehouse's marital status that brings unwanted strangers to town. Rather, it's that she is the only female werewolf in existence -- a prize to any pack. Sean Holloway, the love of Jem's life, has gone to great lengths to protect her. As a new attack becomes imminent, Sean realizes he must take greater measures with Jem's safety or risk losing her forever. His first task must be to marry her, but a force greater than the largest werewolf stands in his way. I am utterly and completely in love with this series and all I have read is one prequel and two teaser chapters from book one. You all know that I am not usually reading adult, and that I am a HUGE YA fan, but this adult prequel has me hooked! The romance in Eternal is breath taking, butterfly fluttering, and serious blush causing. The best part? The blush causing romance starts on page one. Imagine my surprise! lol. The sigh inducing romance is also pretty great. Jem and Sean are an amazing couple. Jem was turned into a werewolf. You would think "no big deal," but she is the only female werewolf in existence. All other females who have tried to be turned have ended up dead. 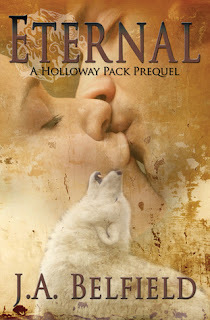 Jem's existence causes a big stir for outsiders to come to her town and try and claim her to their pack, so she must move in with the love of her life, Sean, and his pack. The other problem is that Jem is from a town of humans where an unwed woman living with men is more than just frowned on, its blasphemy. Sean has to do everything he can in order to keep Jem safe and his newest idea on how to do that is making her an honest woman of the community; marry her. Jem and Sean are adorable together. There seriously isn't a time when you're not rooting for them to make it. There is a little bit of a love triangle, but it is unwelcomed from Jem so it's not really a love triangle, but someone else definitely wants her for himself. Point is there are no teams in this book to pick. Trust me, there is only Team Sean. The rest of the characters that Belfield creates are flawless. There are a few that we get to know more than the others, but still they are all overall very well done. Usually prequels are too short for most, but I feel like this story was very, very well done in the short amount of time it is told. I felt pretty content with everything by the time the story ended. Of course I wanted there to be even more story told, but overall I am perfectly fine with the shortness of this prequel. I feel like there wasn't anything missing to it. The story came full circle and now it's time for me to read the rest of the books in this series. With that in mind I need to read the rest of the books in the series... there is a sneak peak to book one with the first two chapters at the end of Eternal and I am completely hooked and obsessed. A lot was packed into those two short chapters and if Belfield can do such an amazing job with only 100 pages I can't even imagine what she can do with 412. Love, love, LOVED this prequel. Eternal is a beautiful paranormal-romance/historical fiction. I think it was beautifully executed and will make you drool for more. Jem and Sean are perfect together and have a really cute relationship that every girl dreams of having. The other characters that Belfield created are also all very well done and don't blend in with the background, they stand out. Even though Eternal is a prequel I feel like it wasn't too short and told the story it needed to tell perfectly. Beware, if you read this prequel you are going to want to read the entire series so get your bank accounts prepared lmao. I will absolutely be continuing on with this series! Sweet, this has all the elements I love in a book and girl I am so proud you are exploring Adult. I read a mix of both and there are sooooo many yummy books out there!